In 1988, American poet and critic David Lehman came up with the idea of publishing annual “best poetry” collections. The success that was soon enjoyed by The Best American Poetry series and similar annual collections in many other countries worldwide, has shown that in spite of declarations that poetry is in crisis due to the lack of interest in it, there are still many good poems, as well as many good readers. The project launched by the Host publishing house in 2009 in the Czech Republic has won acclaim both from the critics and readers. The selection of “best” poems is not meant to convey an illusion of objectivity, but rather to present the subjective viewpoint of the editors on poetry in a particular year and poetry in general. The 2015 volume features approximately forty Czech poems, which were published this year in books, magazines and on the Internet. 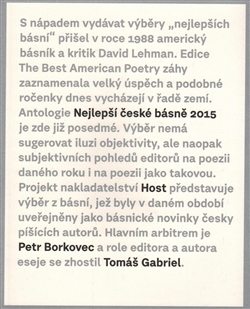 The editors are poet Petr Borkovec and poet and journalist Tomáš Gabriel.